Hello lovelies, I know weekends are everyones favourite but they are mine because I get to spend time with all my boys together! We go to soft ball places, forests, garden centres, shopping, cinema, snow dome, bowling, play football, ride bikes, play with toys, make things, learn new things, watch movies inside, make tents, have sleepovers, most of all new adventures! The odd weekend me and Dan get to have a date night which is so nice, there is nothing better than some time together alone, when I first had Oscar I never ever thought I would say that, I hated being away from him more than five minutes until he was at least 2 years old! He never slept at anybodies house or stayed away from me. I live and breath for my children but that 'me time' is well and truly needed, we need to recuperate to make us stronger for them. Not everyone has an amazing baby that sleeps through all night, eats right and does everything you say all the time, when they hit 2, I feel sorry for you already! I'm dreading Lawson reaching terrible twos, legit there was times I wanted to kill Oscar I thought the Devil had embedded something inside him, yeah that bad aha! Luckily it only lasted 7 months... yeah still a long time but he is so amazing right now, so clever and inquisitive, bubbly, loving and caring I feel so thankful and those terrible twos were so so worth it! To me babies don't stay babies for long and toddlers grow up to be moody teenagers, enjoy this! I'm not saying don't go out, don't live your life, your life has stopped because your a mom but you will never ever get these years back. I am so glad I'm not a going out type of person, I would much rather get all the snacks in and whack Netflix on with my man or go to our local Indian! I have the odd nights out but I'm so over it, people think I'm boring but so what?! Who wants a hangover with two kids to look after? Not me thats for sure. I also have the advantage of being a stay at home mother as Dan thought it would be best, he said why go to work to pay for someone to do a job that they couldn't do better than you? Don't get me wrong it can be hard work and I miss my independence at times, having my own money and just getting some adult time too but I have been so grateful to enjoy every moment and not miss a single thing, I didn't miss first words, first crawl, when they started walking and ate for the first time I'll never forget this, I'll forget the date and time but not the moment. I tried part time jobs but relying on people to babysit on weekends, yeah you can imagine. I want to pursue a career eventually but it can wait, we are comfortable financially and I will never let anyone judge me for being a stay at home mom, people have issues with things that don't concern them why?! Focus on your own life, people will always get judged so you just keep doing what you do best! I am enjoying Lawson being a baby so much but he's nearly 1?! What the hell, where has a year gone? When Lawson grows Oscar seems even bigger! It's scary like your whole life is flashing before you, I'm going to be an old peoples home before I know it. So spending time with them on the weekend is my absolute favourite thing to do! I love having adventures with my children, showing them new places, new things, exploring. Oscar loves animals so we love going to zoos, animal places even the park feeding the ducks and pet shops! Lawson loves the soft play areas and getting all the balls, Oscar also loves these so he can run wild and meet new people, Oscar will literally talk to anyone. If Dan is having a lads night or whatever I usually let Oscar stay up an hour or two later and we watch disney movies with snacks, If I'm out at my friends house or late night shopping or a blog event Dan turns the sofas upside down and makes a fort, Oscar loves the 'man cave' girls are gross and can't go in the 'man cave' but I make an exception because I'm a god girl according to Oscar aha thank god, because it is so cosy! Our best days out are usually the free ones, the forest is my favourite I feel like I'm in another world when its just the trees surrounding us and all the fresh air. 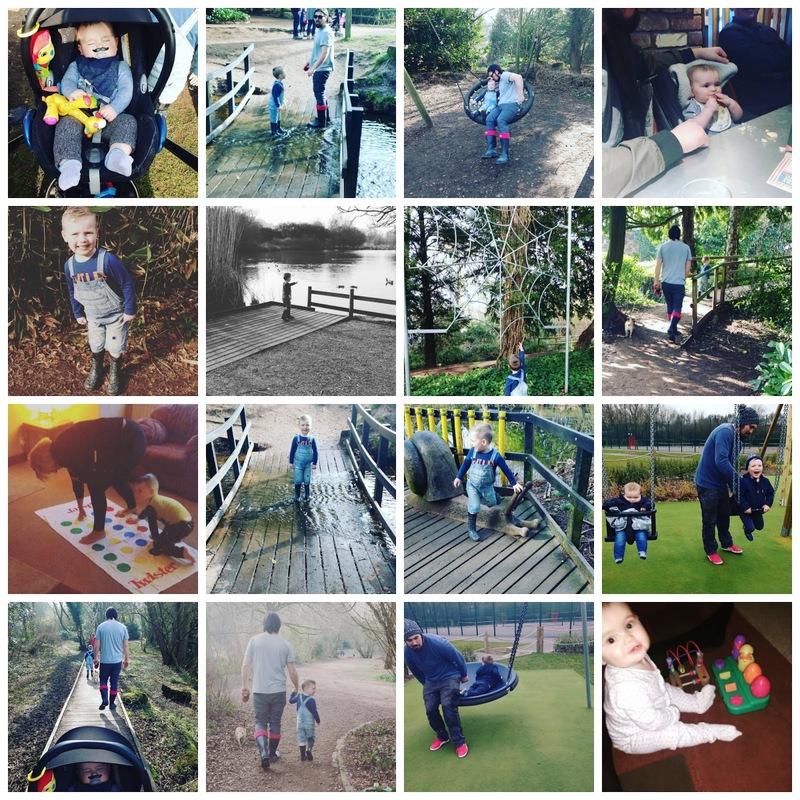 We get coffee on the colder days and stroll for an hour or so with Duke our dog (who I still need to introduce) and go on the little park there, jump in muddy puddles, make wigwams, go on nature trails and collect things for making later at home. The new park we discovered in Hednesford is so nice, we went there this weekend just gone and Oscar cried so much because he didn't want to leave it was that good. If were not out or chilling at home we usually go to see Nanny Jayne (Dans mum), she helps us out so much, always takes me out with the kids if Dan's working, she has Oscar over for sleepovers on Fridays and I don't honestly know what we would do without her, amazing babysitter but more importantly an amazing Nan, nothing is ever too much for her she will always put someone else before herself, I'll always be grateful for having her in our life. He sometimes sees his other Nans (my mum and nan) but more so Jayne she works Monday to Thursday but takes up her free time to see the kids and help us out so we go around there on the odd Sundays and just play with toys, make things and play hide and seek because their house is huge. What do you love doing with your family/children? Why are weekends your favourite?